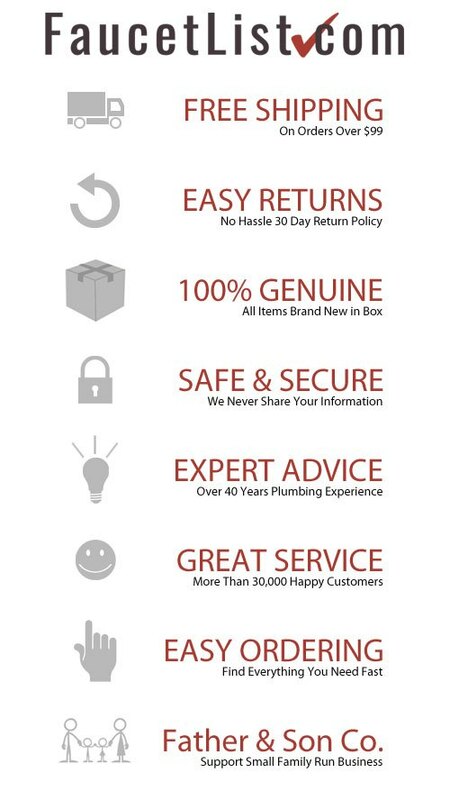 At FaucetList we have over 40 years' experience in the plumbing industry. Delta Shower Systems have always been some of our best selling products. We know that buying a Custom Shower System can be a little tricky. There are just so many small components required if you want to build a Complete Shower System. For example, to buy this Delta Shower System you would need to hunt down and order 6 individual parts. So difficult! At FaucetList.com it's our goal to make things easy! We have included ALL NECESSARY rough-in valves, cartridges, handles, and other required fixtures so that this shower faucet package will arrive to you complete and ready for installation. Don't spend hours searching for every little piece separately. 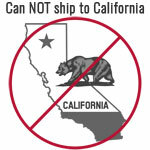 Don't delay your project by ordering wrong/incompatible parts. Make things easy! 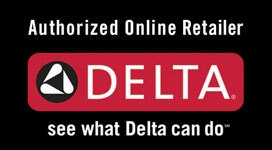 Order everything necessary for your Delta Shower System from the same place. We offer fast and free shipping on all Shower Systems. Add to Cart Now! All fixtures included in this Delta Custom Shower System Package come in Chrome Finish. Please note that while the fixtures in the image may appear to have a slightly different finish, in reality all items will match each other perfectly! This difference is caused by lighting and photography issues and NOT by differences in the finish of the products themselves. Lower Dual Shower Control Handle: To turn on the water, rotate the large lower shower control handle. The water volume will increase as you rotate counter-clockwise. Use the small secondary handle to set your desired water temperature. This Shower System features a Delta Monitor 17 Series Pressure and Temperature Balanced Cartridge with a 6.98 GPM flow rate at 80 PSI. This Shower System includes a Tub Spout. When you turn on the water it will initially flow from the tub spout. 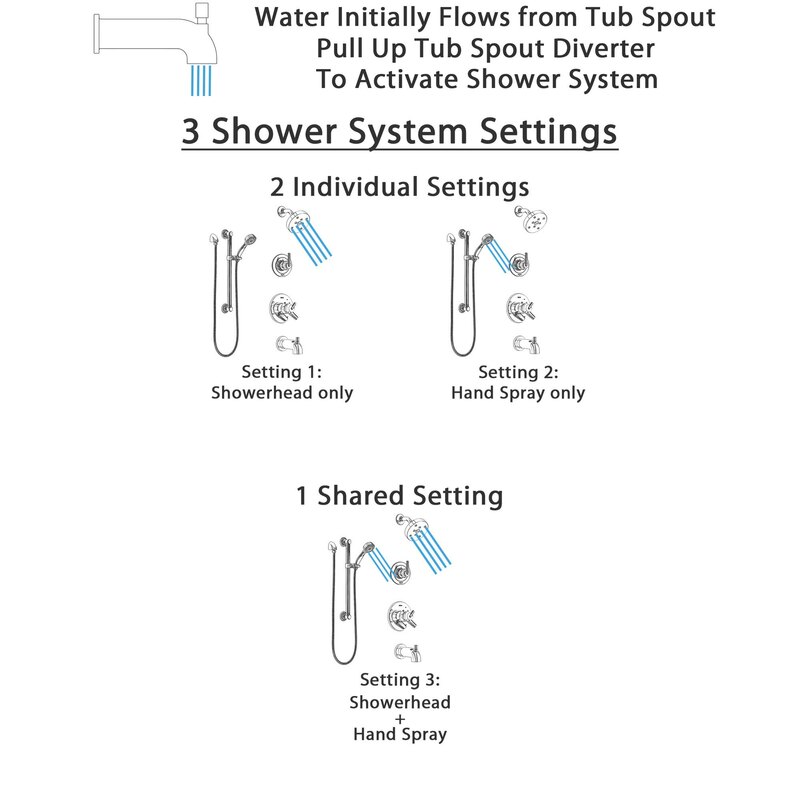 Pulling up the tub spout diverter will activate the shower sprays. 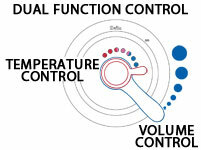 3-Setting Diverter Control: The Shower Diverter Handle gives you full control of your custom Delta Shower System. The diverter valve installs between the shower mixing valve and the peripheral shower system spray outlets. The diverter's job is to divert mixed warm water to the various shower sprays in your system. The different settings allow you to choose which shower spray heads will be on at any given time. With a 3 setting Diverter you get 2 individual positions and 1 shared position. This means you can run either shower spray group individually or both together at the same time. Bathroom Safety is Important! The Hand Shower Slide Bar included with this Shower System doubles as an ADA approved Grab Bar. This great looking Grab Bar provides important bathroom and shower safety for you and your family. Shopping at FaucetList.com is easy! Our goal is to make buying Shower System Hardware easy. Purchase this Delta Shower System today and get everything you need for installation delivered fast! Delta Shower Systems represent cutting edge precision design. All fixtures include a lifetime manufacturer's warranty on both operation and finish. Make things easy and order everything necessary to get your Complete Custom Shower System ready for use. Buy this Delta Trinsic Chrome Finish Tub and Shower System with Dual Control Handle, 3-Setting Diverter, Showerhead, and Hand Shower with Grab Bar SS174593 Now! 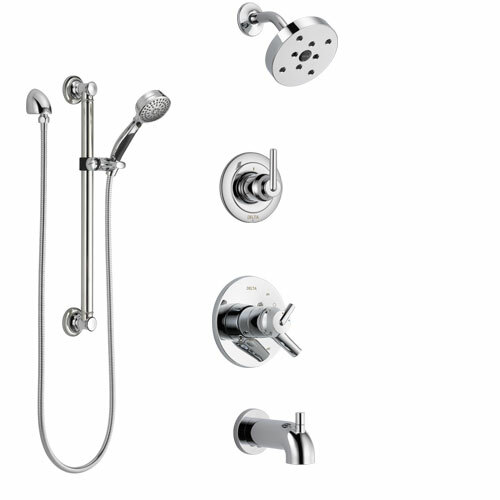 INCLUDES: Chrome Delta Trinsic Collection Shower Faucet System with Delta R10000-UNWS Tub and Shower Rough-in Valve. Also includes Tub Spout with Pull-Up Diverter. This Shower System features a hand shower with slide / grab bar: Normal slide bars are good for holding the hand held showerhead but not much more. The hand held shower included with this Shower System comes with a 24" long 1-1/4" diameter ADA approved grab bar in place of a normal slide bar. This grab slide bar not only looks nice, but it offers extra safety and security. Slipping in the shower is a real danger and having the added security of a grab bar to assist you when you're getting in and out can help! Delta Shower systems with hand shower grab bars give you this important extra safety feature while still looking great! This Slide bar / Grab bar supports up to 500 pounds of force. Make sure to strictly follow installation instructions. Buy this Delta Trinsic Chrome Finish Tub and Shower System with Dual Control Handle, 3-Setting Diverter, Showerhead, and Hand Shower with Grab Bar SS174593 Now!